When I reviewed the iPhone 6s and 6s Plus earlier this year, I lamented the fact that companies like Apple seemed more eager to build thinner phones than improve the battery life. That industry-wide trend made battery cases a near-necessity, and now Apple wants a slice of that market too. Enter the Smart Battery Case, a $99 (£79) add-on for the iPhone 6 and 6s that packs an extra 1,877mAh battery into a... curious-looking silicone frame. You can nab one for yourself starting today, but before you do that, let's take a closer look at the company's handiwork. 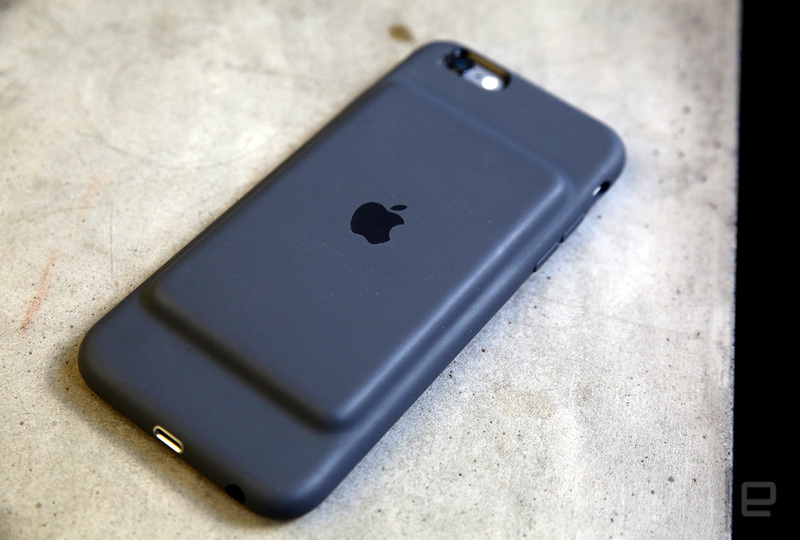 It was only a matter of time before Apple made its own battery case, right? 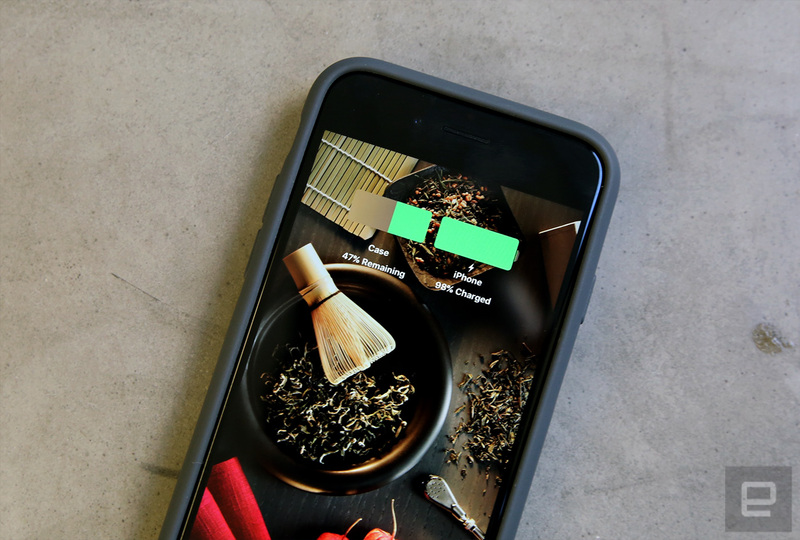 Too bad its debut effort, the $99 Smart Battery Case, is a bit of a hard sell. It certainly works as advertised, and niceties like iOS integration and the ability to charge the phone and the case at the same time add to its appeal. Still, there's no shortage of less expensive alternatives with bigger batteries, so only Apple die-hards need apply. Be the first to review the Smart Battery Case? The case itself is made of the same silicone as Apple's other protective shells, and like those accessories, it's made from a single sheet of material. 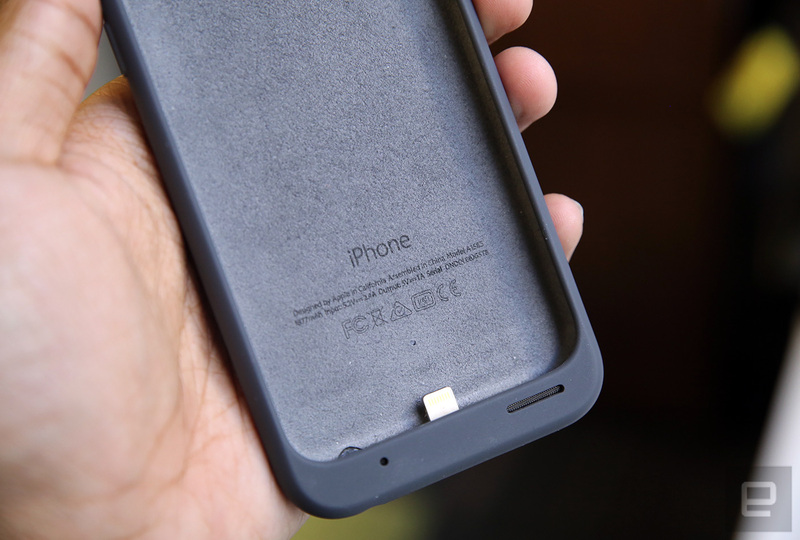 Rather than connect two discrete pieces as you would with a Mophie, there's an elastomer hinge at the top which you bend to slide the iPhone 6 or 6s into place. Strange? Maybe at first, but I found that pulling the phone out and shoving it back in quickly became second nature. Can I be frank with you? The first time I laid eyes on this case I hated it. I was surprised, too, that a company that supposedly values clean, attractive design would produce a product with such a conspicuous lump in it. I don't think I can put it better than my editor Dana did: According to her, the case made my iPhone look like it just finished a big lunch. Seriously, though, it's an odd design choice and one that vaguely reminds me of the Droid Incredible's plateaued back. It turns out that a lot of thought went into this decision: The priority was to keep the edges trimmer than the battery section to maintain an illusion of thinness. Maybe this look works for you, maybe it doesn't; if nothing else, the case isn't cumbersome. In fact, it's actually pretty comfortable to hold in your hand, though the silicone will cling to your pants pockets whenever you take your phone out. Nestled directly under that hump is a passive coupled antenna meant to help mitigate the sort of reception issues that can arise when using a denser battery case. In fairness, I've never noticed spottier reception as a result of using a Mophie, but apparently others have had issues. Meanwhile, there's a Lightning port for power and data pass-through on the bottom edge, along with a hole that leads into the headphone jack. That hole is actually a little shallower versus cases like the Juice Pack Air, allowing you to plug in a pair of EarPods without trouble. Those of you with chunkier or L-shaped jacks are out of luck, and the case doesn't come with a headphone jack extender either, though I'm told Apple will soon sell one made by Belkin. Oh, and speaking of things that don't come in the box, you'll need to provide your own Lightning cable and USB charger. On the flip side, the case directs the phone's speaker output toward your face, and it sounds a lot better than the default, downward-facing configuration. Apple's cases are pretty spartan to start with, but the Smart Battery Case also lacks a power button. Once you plug your phone in, it'll charge until the case is empty. That's the same way the iPhone handles power when it's connected to a standard power adapter -- it draws juice from that source instead of depleting the internal battery -- but the neurotic FOMO-type in me still wishes I had a way to shut it off and conserve power for when I needed it. By extension, it shouldn't surprise you that I spent my first day frequently checking the battery life level. 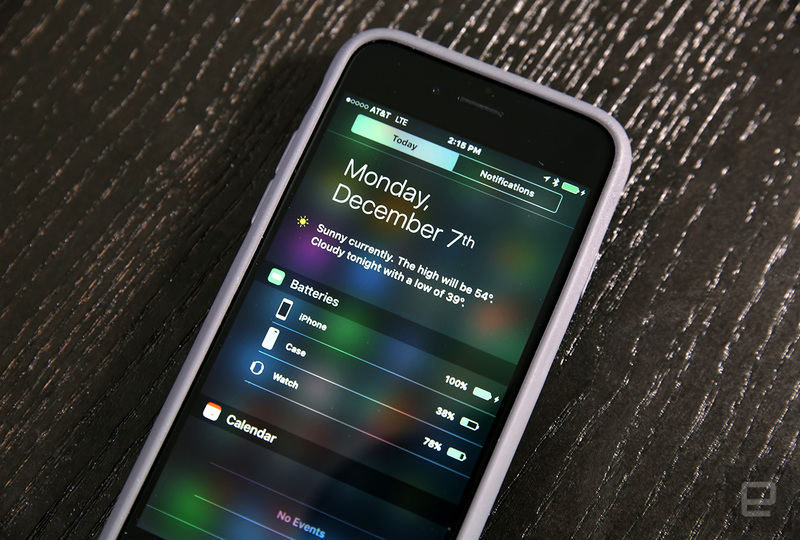 You'll find the case's power stats in the Notification Center, and charge levels for both the phone and case will pop up when you slide the handset into the case. There's also a single LED on the inside of the case that's surrounded by microfiber; it glows amber while charging. Oh, and try to use a 10W or 12W charger if you can (think: the ones come with iPads): They'll charge the case and the phone at the same time. Apple claims you'll be able to get 25 hours of talk, 22 hours of HD video playback, or 18 hours of LTE web browsing when you pair your iPhone with the Smart Battery Case. Those are pretty huge gains compared to the 14-, 11- and 10-hour estimates Apple makes for the iPhone 6s, which has a very slightly smaller battery than last year's iPhone 6. I spent my weekend testing the case with the iPhone 6s, and while performance can vary wildly depending on usage, Apple's estimates mostly held up well. 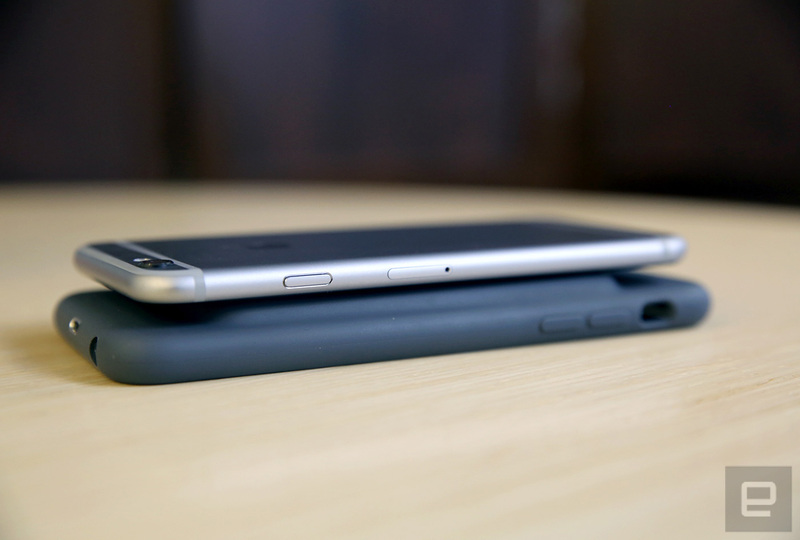 When I was using the 6s as I normally would -- sifting through threads on Reddit, watching YouTube videos and playing the odd game or two -- the Smart Battery Case lost between 15 and 20 percent of its battery life in an hour. As such, I usually got about five to six hours before the case died completely and the phone switched to its internal battery. After that, the iPhone 6s ran on its own power for just under 13 hours on average, for a total of 18 or so hours of near-continuous mixed usage. On days when I toiled mostly on my computer, the battery case stuck around for closer to eight hours, meaning I was almost completely done with my work day by the time the case had to come off. When it came time for our standard rundown test, the 6s lasted through 19 hours and 21 minutes of continuous video playback with the screen brightness fixed at 50 percent and WiFi connected. That still falls short of Apple's own claims, but I'm not shocked; the 6s also missed Apple's estimates when I reviewed it earlier this year. After a day or two of this, I basically stopped worrying about the battery... until the cognitive dissonance set in. You see, the iPhone is designed to use all the available from an external power source before switching to its internal power. In this case, your phone will remain fully charged (or close to it) until the battery case dies. The lack of an on/off mechanism, though, means you can't have the case on and save power for later when your battery starts to dip into the danger zone. In practice, it doesn't matter -- you didn't have to worry about your phone's battery dipping at all for hours -- but I still felt powerless when faced with a dry battery and an iPhone on the verge of death. Technology sure is great at giving us new things to fret about. Then again, I've more or less been trained to think of battery cases like this; as things meant to help out in a pinch. I can't lie and say I'm already used to Apple's method, but I see why they did it. Maybe you won't have as much trouble adjusting. 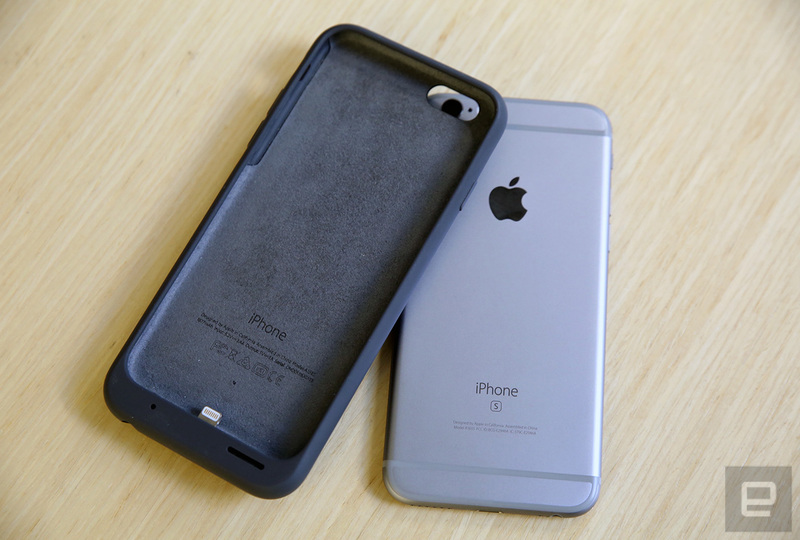 Battery cases are ubiquitous, with no shortage of options if your iPhone 6 or 6s needs help getting through the day. If you're looking for something pocketable and cheap, Mophie's Juice Pack Reserve for the 6 and 6s might be right for you. It's even slimmer than the company's Juice Pack Air (despite the name), and at $60, it's almost half as expensive as Apple's option. I personally find its sleek, curved chassis a more comfortable to hold, but be warned: It packs a slightly smaller 1,840mAh battery. Like most other options, though, it uses a micro-USB port to charge so you can't transfer power and data while the iPhone's inside it. Too rich for your blood? We (and our friends at The Wirecutter) are also fond of Anker's Ultra Slim Extended Battery Case, thanks to its slim 0.53-inch design and relatively large 2,850mAh cell. Not too shabby for $40. If you're the sort who just really likes Apple's cases, you might be better off buying a first-party silicon skin and something like a Jackery power bank for a fraction of the price. Just remember what you're missing out on: Only Apple's battery case gives you a power readout in your Notification Center and the ability to charge and sync with a single cable. Whether that's worth the premium is up to you. Apple's first battery case works, and it works well. Here's the rub, though: There are plenty of cheaper, more capacious options, and some of those are prettier too. What the Smart Battery Case offers over its rivals is a sense of cohesiveness that stems from Apple controlling both the hardware and software experience. The convenience of a Lightning pass-through for easy data transfers and power reminders in iOS might make the case's $99 price worth it for some of you, but everyone else could spend half that on a third-party case.